Made it back to the lower 48. The samples remained frozen throughout the trip and will remain frozen until we start processing them. This trip has been a whirlwind – but fun. Dave and Peter made this an extremely successful sampling! Alaska is such a beautiful place and a great place to study. I did not see any polar bears, even though the last day I claimed I saw something peculiar that looked like a white animal (it was likely just piled up snow). We did see some arctic foxes, musk oxen, and moose though! 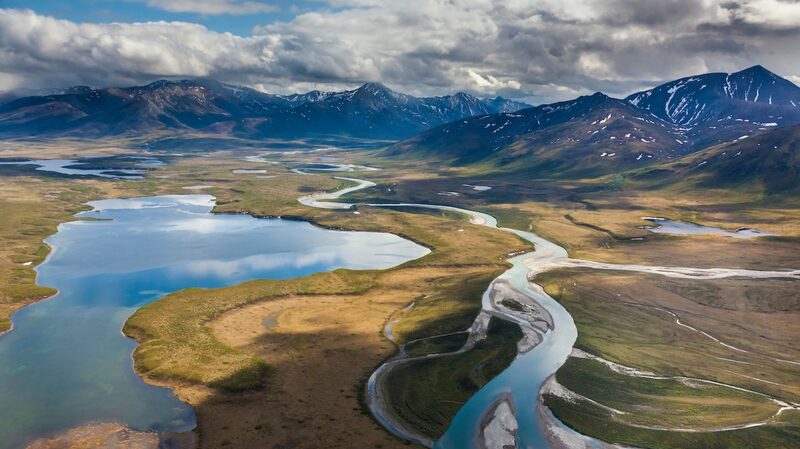 The landscape in this area is so beautiful and very interesting things happen in permafrost. Last summer I wrote about solifluction lobes and polygon wedges but this spring I want to introduce pingos. Pingos are another modification of the landscape due to the uniqueness of the freeze/thaw cycles and permafrost. It was hard to get a good photograph of these pingos but they were abundant! Dave was fundamental in those two days of sampling, so his work was done. He left back for Fairbanks Tuesday morning. Peter and I started working on preparing the cores for further analysis at OSU. Our goal was to separate the cores into different depth classes. We got a system down where I would cut the cores into 7.6 cm increments and then Peter would use a bulk density corer and hammer into the cut piece to get the outside, presumably contaminated outer layer off. Our system worked well but it did take a substantial amount of time. We had extensive cleaning practices to follow between each sample to not cross contaminate. We took turns playing our favorite music, good thing we shared a similar taste in music. This part of the project took us two and a half days to complete which gave us enough time to clean up the work space, pack up our gear, and return borrowed items. Thankfully, all of the samples fit into 2 coolers which will be way easier to navigate than 5. The goal is to keep them frozen during transit. Our dry ice has sublimated so we are using frozen powerade bottles to keep them nice and cold. We are hoping for an easy travel day tomorrow! The sun came out and the wind gave us a break! Sunday morning went fairly smooth, with the exception of the rod breaking where the motor and the drill bit attach. We resorted to taping to the two pieces together (not ideal but we did what we could with where we were at). You can see how big the auger is and how it moves in the video. We started with two people working the auger (typical) but eventually found that Dave was the most efficient at handling this thing. First of all, it is HEAVY. Second, you have to keep this thing in motion (up and down so that the auger would not freeze to the surrounding earth). Basically, the heat from the friction was enough to have slight melting but as soon as you would turn the auger off, it would simultaneously freeze. This deemed to also be an issue for the sample that was within the auger itself. So, we would have to really work at dislodging the sample when this would happen. We found ourselves strangely happy when the core sample was loose within the auger. It’s the small things..
We were moving at a pretty rapid pace. We had expected that we would get a core/hour. Throughout these two days, we were getting a sample in ~20-30 minutes! Which was great. I was beginning to think that it was not a big deal that we lost our first day and that we would be able to make up for that time without any problems. As some of you know, fieldwork is never that easy, I mean, most things are never that easy. The missing rod was becoming a dramatic situation. That area was not that secure, so there was some pretty intense wobbling. This made it even more difficult to handle the auger. Sunday night Dave cut off the top of a rubber boot to put around the area (which happened to fit pretty well) where the motor and drill attached (where that broken rod once lived). We also constructed a backup device to secure that area if the rubber boot did not work out. We used this boot top for the remainder of sampling. By Monday evening, we decided that the rig was just too dangerous to keep going. It was so wobbly and was a big issue because our precious kneecaps and, at times, our faces were right there (less than a meter away). If this thing were to come apart while operating, it could have been a pretty bad scenario. Fast moving, sharp metal – no thanks. Ultimately, we ended up getting the cores we wanted at distance classes of 10, 50, 100, 300, and 1000 m with some field duplicates. Overall, we got majority of the samples we wanted and in just 2 days! Pretty remarkable. A ton of hard work went into getting these samples. Patrik, the pilot, must have thought we were sort of crazy, he told me we looked like elves out in the field. He also inspired me to change the title of my thesis to “Fancy Dirt”. Today was our first day of sampling. We were a bit overweight with us and all of our gear heading into the field, so Dave took a separate flight into Noatak village where he would get picked up after Peter and I and all of our gear would be dropped off near the haul road. Conditions were harsh this morning. It was sunny but extremely windy. So windy and cold, in fact, that my eye lashes were sticking/freezing together! It took me a moment to get myself situated, my hands were frozen too, and to mentally prepare that this was going to be how sampling would likely be during this sampling. It was intense! There was snow covering most of the surface and we were able to see some pretty obvious directional patterns of the fugitive dust near the road. We put the SIPRE auger together and as we were trying to start the motor, which seemed flooded, Peter’s extraordinary muscles broke the motor cord! Under these conditions, this was not something we wanted to deal with in the field so, feeling a bit defeated, we headed back to Kotz to take care of the motor issue and to prepare back up plans. It’s hard to describe the mood this evening, things seemed awfully grim, but Dave’s patience persevered and he got the motor working again. We also put together the trough to cut the cores in, so the day was not a total loss. We were ready to get back out there and planned to work some pretty long hours the following days. Cue beautiful landscape photo for stress relief from this day. After hauling 5 full coolers and heavy bags of personal gear, I made it back to sunny Kotzebue! Peter picked up Dave and I from the small Kotzebue airport and we hauled our gear to our bunkhouse which is near the Park Service station. We are staying in Kotzebue throughout our stay and will take a helicopter to and from our sites over the next few days. Patrik, the Swedish pilot that we flew with last summer, will be our pilot again this sampling trip. Aside from taking classes, Elisa and I, along with a great group of undergrads (Callie, Mia, Gillette and Hannah – see image below) have been preparing all of the moss samples collected in Cape Krusenstern National Monument (CAKR). This involves drying, cleaning, and homogenizing (blending to make a uniform, homogenous sample). All of these steps are unexpectedly time consuming, but we are getting close to finishing. Once those steps are complete, Elisa and I will start analyzing the samples this summer. Elisa has also been cracking away on her lichen species population work. She’s become quite the statistician over the last couple of terms—more to come from her soon. Meanwhile, I have been trying different techniques on the 32 peat and soil samples that I collected. I am interested in evaluating the environmental fate of metals that are deposited onto the tundra generated by the transportation of raw ore. This pilot study has some pretty interesting results. Interesting enough that we decided it is worth going back and refining that sampling. We had some concerns regarding that initial sampling. For example, I was basically digging small pits and grabbing “clean” samples from that pit. However, conditions were quite wet, and the pits would quickly fill with water. This lead us to believe that we are missing some of the metals that we suspect are in the pore water space. Ultimately, we decided to sample when the ground is frozen so that we can capture the true soil profile. We are going to sample with a SIPRE auger. (Picture to come soon, believe me when I say this thing is awesome.) We are working out the logistics now, but currently, Dave Swanson (Arctic soil extraordinaire) and I will be sampling for 4 days in CAKR all by helicopter. Our goal is to collect 45 cores in those 4 days. That math is sort of scary—but we are going to pump out a few hard days of work to get some pretty unique samples! Weather conditions in Kotzebue are not too daunting as of now. Good thing Dave and I are from Minnesota—we welcome the cold. Freezing conditions>mosquitoes. I am really looking forward to this experience. I am so lucky that I get to participate in this research in such an incredible place. There is even the possibility that I would get to see polar bears and Aurora Borealis! More to come. I arrived in Oregon in June, of 2016, having never eaten an oyster, let alone studied them. Since then I’ve learned about their life cycle, importance to the environment, their service as a harvestable resource and have developed the unnatural ability to know the phase of the moon and the times of the low tides. It has been a little over a year since the oysters I’ve been cultivating in Netarts Bay were initially deployed and so it’s time to write a blog post. The growth has been more physical than mental for the oysters. They’ve gone from a few millimeters to an average of over 5 cm in length. My growth, on the other hand, has been much more mental. I’ve had the opportunity to work with and learn from some incredible people in the College of Earth, Ocean, and Atmospheric Sciences, here at Oregon State University. I’ve been extremely lucky to work with my advisor Dr. Alyssa Shiel, as well as Drs. George Waldbusser and Adam Kent on this research funded by Oregon Sea Grant. I’ve also had the opportunity to work with an amazing set of graduate students and who’ve taught me so much in the past year. So what have I been doing over the past year and why? Read more in the following weeks as the series continues on my website, http://blogs.oregonstate.edu/wensmans/. The day of our departure finally came, Wednesday August 2nd! Based on our schedule, we would be finishing all work that Sunday, giving us two days to pack and wrap up any loose ends. As it turned out, these two days were invaluable. We were able to collect several more “independent moss collections”, sample three sites which were only 3 meters from the road, take some road/soil collections and finally give Kali time to work on her protocol for her soil sampling. All in all, from the months’ work of data we will have quite a bit to work with! Now the only question was if we were going to be able to leave on the 2nd. Wednesday came and it was a dim foggy morning, exactly what we dreaded. Time inched along with frequent calls to Peter, with each party affirming their readiness the moment the weather cleared. The frequent question was: “can you see the top of the mountain to the SE of the airstrip?” To which I replied early on, “I can’t see the airstrip”. Things did not look good, we waited around in the TV room with the other people who were grounded by the weather. They had many jokes for us “don’t think you guys are leaving today…hahaha”. Finally, around 10 am we could almost see the top of the mountain, I called Peter and we set the wheels in motion. He called Rick (our NPS pilot), we called the mine to get a ride with all our gear to the airstrip. 10 minutes later, were standing on the airstrip, I call Peter again on the satellite phone. Things have gone awry, he cannot get ahold of Rick and is not sure if the other pilot has left or not. We realize priority number one, if there is only one plane the samples must be taken out first with one person to ensure they get back to Oregon safely. Two people will need to stay until Saturday if that is the case. We decide Kali should be the one to go. We quickly exchange all contact info for her to be able to return the gear in Kotzebue, and get on the Alaska airlines flight the following day. After waiting some time with no planes in sight, we are forced to return to camp as our truck driver will soon need to shuttle other people. At this point, no one knows if the pilot will make it there, and we decide to bring all our gear back to camp and unload. As soon as we are almost done unloading, someone from inside the camp comes out and says that the red dog tower said our plane has arrived! We are ecstatic and immediately reverse our actions putting all the gear back in the truck. Once at the airstrip, there are in fact two planes! It seems as if the other pilot did in fact come, and yet we see no pilots? After some time, we realize the pilots are in the red dog tower waiting out the weather and we now gather that the NPS pilot did not come, but the original second pilot who we hadn’t heard from along with a co-worker of his is there. He explains that “he was in the area” and thought he would come by with a second pilot. It now appeared that we would be able to leave, except that the weather took a turn and we only had two flight vests (with a personal locator beacon-PLB). After some confusion about what the regulations are, we found out fortunately that there only need be one PLB per plane-phew! Now if only the weather would clear. Finally, at around 3 pm, after a few instances of the pilots telling us that they might just leave without us- (less problems without passengers) the weather cleared just enough for us to leave! Kali and Beth went in one plane, and I went in the second and we took off! Away we went, after that all logistical issues were a piece of cake. Now that we are back in Corvallis, we will each take a well-earned break. After that, there will be much work to do. This will include, organizing all lichen samples and identifying them to species. Once this is done the species lists will need to be updated. At the same time, Kali and I will begin processing the frozen moss tissue samples to eventually begin analyzing their metal contents. I look forward to all the following stages in this project and am excited to say that we completed a successful and fruitful field season all thanks to the tireless efforts of Beth, Kali, myself and Peter. Go Team Lichen 2017! As with any field work hitch, we have some loose ends to tie up on out last day at Red Dog. Today will be our last trip into Cape Krusenstern. We will collect a couple of moss samples a few meters away from the side of the road, and will visit one plot where our data file seemed to have been corrupted. All of this work should only take a few hours, and will leave plenty of time for us to try and clean all of the dust caked onto our gear, to pack, to eat (it is taco Tuesday tonight!!! ), and to say our goodbyes to our new friends around the camp. I think that we will all miss the beautiful tundra and interesting people of Red Dog. However, we are all very excited to be free of the Red Dog Mining Camp, and of the potential grizzly encounters (we’ve seen over 20 to date). Stay tuned for another posting about what the next phase of this project will look like! Rain. Wind. Mosquitoes. You have to pick at least one. Which would you rather? If you were at all curious, all of us unanimously chose wind.